Just sit down and enjoy, watch the ducks and rowers and do nothing else – except maybe have a cold beer and eat the best Flammkuchen you can find in Hamburg’s south… Where is the best place for this? If you ask me – it’s the beer garden „Zum Anleger“, which hides behind the Vogelhüttendeich at the Ernst-August Canal in Wilhelmsburg! PS: A canoe rental is also part of this deckchair paradise. → LOCATION: Vogelhüttendeich 123, 21107 Hamburg I Website / Google Maps . Spring is the best time to travel to Japan. The fastest way leads to Hamburg’s city lake Alster, because from April on all the cherrie trees are blossoming like in the land of the rising sun. There are about 5000 pink beauties by now. Since 1968, the Japanese community has planted one for every Japanese living in Hamburg and organizes a cherry blossom festival every year in May to thank the city for its hospitality. The festival’s highlight is the most magnificent firework of the year. But even in the weeks before and after you should get some take-away Sushi and Sake and celebrate Hanami, the beauty of the cherry blossom – probably the greatest little time-out of the year. … and the honking cruise ships in view! 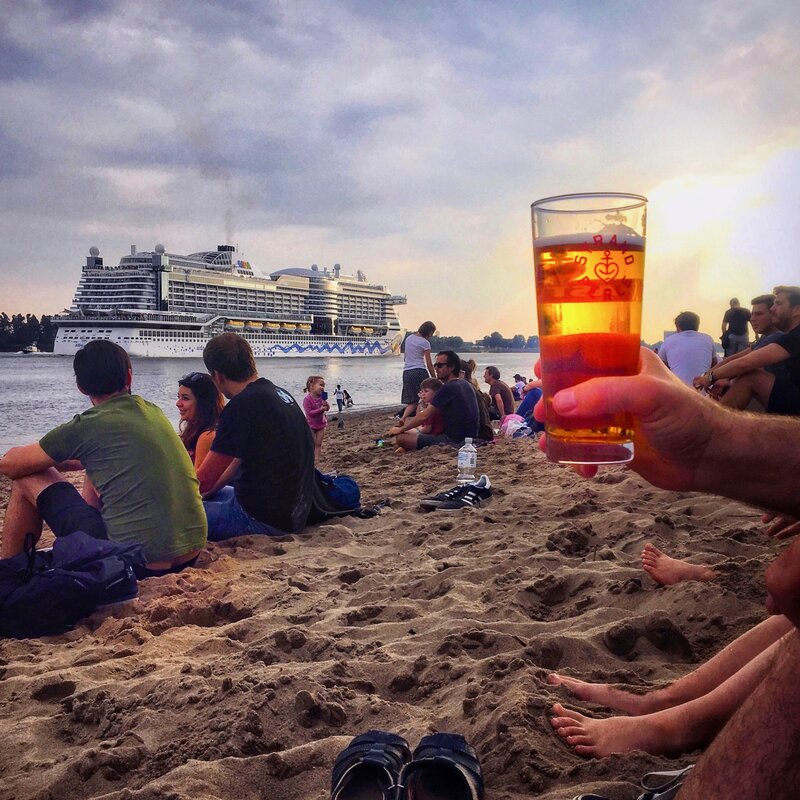 When you sit at the river Elbe in the evening, for example at the Strandperle Bar, you sometimes ask yourself who is more to be envied – the cruise ship passengers waving graciously from their balconies as their ship glides through the Elbe to set sail for Spitsbergen or across the Atlantic? Or the Hamburgers sitting by the water with a beer, politely waving back… The answer is clear. Who needs a cramped cabin on a – sorry – floating silo when you can also sit on the fine sandy beaches of Övelgönne, one of Hamburg’s prettiest parts? Up on the Pinnasberg, artists have created an alternative Caribbean dream for Hamburg. The art and socio-political project in St. Pauli’s Antonipark was realized in summer 2005 after a long tug-of-war. With its plastic palm trees and undulating lawns, „Park Fiction“ has since become an urban recreational destination where you can watch ships, cranes and basketball players. And someone will always bring along a ghetto blaster for the right soundtrack..
And if it should be a little cruise, I recommend Frau Hedi’s Tanzkaffee. What sounds like filter coffee and cream cake is the exact opposite. When this barge leaves the ponton, it’s great fun: disco balls glitter, beer is ready and happy crazy people dance to loud music from bad loudspeakers. Sixties Soul, Hula Punk, Serbian brass music, Finnish Tango, Gypsy Swing, Latin Helicopter Soul or Shoegazer Pop – this is the sound to which the Hedi (and sometimes her sister ship Claudia) sails through the harbour of Hamburg, past dry docks, cranes, tankers, and Elbphilharmonie. By the time the diesel dust hits your nose, you hold on to your drink and the only thought passing through your head is: Well, sometimes the good is just damn near!